Draft: 2013, Seattle Mariners, 5th rd. Selected by the Atlanta Braves in 31st round of the 2010 First-Year Player Draft (did not sign)...Selected by the Seattle Mariners in the fifth round of the 2013 MLB First-Year Player Draft...Attended East Carolina University (NC); was a teammate of RHP Mike Wright...Attended Ardrey Kell (NC) HS. Recorded his first career hit on 8/15 at BAL off RHP Cody Carroll; entered the game as a pinch-runner and singled in his first plate appearance... Hit safely in four of his first five games after being recalled...Recorded his first Major League stolen base in his season finale, on 9/29 vs. MIA... 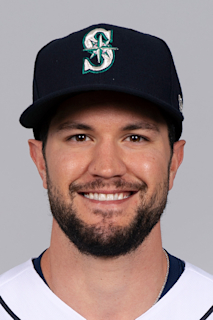 Started the season with Triple-A Reno; designated for assignment on 7/27 by the Arizona Diamondbacks and claimed off waivers by the New York Mets on 7/31. Appeared in 2 games for the D-backs in his first Major League season...Hit .278 AVG/.341 OBP/.351 SLG with 19 doubles, 2 triples, 4 home runs and 56 RBI in 129 games with Triple-A Reno...Recorded his 600th career Minor League hit on Aug. 13, 2017. Spent the season with Triple-A Reno, hitting .288 (144-for-500) with 28 doubles, 7 triples, 2 home runs, 48 RBI and 20 stolen bases in 132 games...Named to the PCL midseason All-Star Team...Ranked sixth in the Pacifi c Coast League in hits and seventh in games…recorded a team-best 41 multi-hit games...Tabbed by MLB.com as Arizona's No. 10 prospect following the season…entered the season ranked by Baseball America as the No. 12 prospect in the D-backs' system and No. 14 by MLB.com...Was a non-roster invitee to Spring Training with the D-backs. Split the season between Double-A Jackson (Mariners) and Double-A Mobile (D-backs), hitting .270 (131-for-485) with 24 doubles, 5 home runs, 42 RBI and 21 stolen bases...Ranked ninth in the Southern League in stolen bases...Acquired from Seattle on June 3, with C Welington Castillo, RHP Dominic Leone and OF Gabriel Guerrero for OF Mark Trumbo and LHP Vidal Nuño...Played with Salt River in the Arizona Fall League...Entered the season ranked by Baseball America as the No. 17 prospect in the Mariners' system. Combined to bat .276 (144-for-521) with 22 doubles, 5 triples, 3 homers and 58 RBI in 130 games with Single-A Clinton and Single-A High Desert...Named to the Midwest League midseason All-Star Team...Reached base safely in 18 straight games from April 30-May 19. Named to the Northwest League midseason All-Star Team in his fi rst professional season with Class Short-Season A Everett...Ranked among the NWL leaders in hits (6th, 67), stolen bases (T-6th, 18) and walks (10th, 32). February 22, 2019 Baltimore Orioles invited non-roster SS Jack Reinheimer to spring training. February 14, 2019 Baltimore Orioles sent SS Jack Reinheimer outright to Norfolk Tides. February 7, 2019 Baltimore Orioles designated SS Jack Reinheimer for assignment. January 28, 2019 Baltimore Orioles claimed SS Jack Reinheimer off waivers from Texas Rangers. January 24, 2019 Texas Rangers designated SS Jack Reinheimer for assignment. November 20, 2018 Texas Rangers claimed SS Jack Reinheimer off waivers from Chicago Cubs. November 2, 2018 Chicago Cubs claimed SS Jack Reinheimer off waivers from New York Mets. September 3, 2018 New York Mets recalled SS Jack Reinheimer from Las Vegas 51s. August 24, 2018 New York Mets optioned SS Jack Reinheimer to Las Vegas 51s. August 13, 2018 New York Mets recalled Jack Reinheimer from Las Vegas 51s. July 31, 2018 New York Mets claimed SS Jack Reinheimer off waivers from Arizona Diamondbacks. July 31, 2018 SS Jack Reinheimer assigned to Las Vegas 51s. July 27, 2018 Arizona Diamondbacks designated SS Jack Reinheimer for assignment. July 21, 2018 Reno Aces activated 3B Jack Reinheimer from the 7-day disabled list. July 16, 2018 Reno Aces sent SS Jack Reinheimer on a rehab assignment to AZL D-backs. May 27, 2018 Reno Aces placed 3B Jack Reinheimer on the 7-day disabled list. March 16, 2018 Arizona Diamondbacks optioned 3B Jack Reinheimer to Reno Aces. October 10, 2017 Jack Reinheimer roster status changed by Arizona Diamondbacks. October 4, 2017 Arizona Diamondbacks reassigned SS Jack Reinheimer to the minor leagues. October 2, 2017 Arizona Diamondbacks recalled SS Jack Reinheimer from Reno Aces. August 4, 2017 Arizona Diamondbacks optioned SS Jack Reinheimer to Reno Aces. August 1, 2017 Arizona Diamondbacks recalled Jack Reinheimer from Reno Aces. March 17, 2017 Arizona Diamondbacks optioned SS Jack Reinheimer to Reno Aces. November 18, 2016 Arizona Diamondbacks selected the contract of Jack Reinheimer from Reno Aces. April 4, 2016 SS Jack Reinheimer assigned to Reno Aces from Mobile BayBears. February 3, 2016 Arizona Diamondbacks invited non-roster SS Jack Reinheimer to spring training. June 4, 2015 SS Jack Reinheimer assigned to Mobile BayBears. April 7, 2015 SS Jack Reinheimer assigned to Jackson Generals from Bakersfield Blaze. March 7, 2015 SS Jack Reinheimer assigned to Seattle Mariners. August 12, 2014 Jack Reinheimer assigned to High Desert Mavericks from Clinton LumberKings. August 3, 2014 SS Jack Reinheimer assigned to High Desert Mavericks. April 1, 2014 SS Jack Reinheimer assigned to Clinton LumberKings from Everett AquaSox. March 3, 2014 SS Jack Reinheimer assigned to Seattle Mariners. June 13, 2013 SS Jack Reinheimer assigned to Everett AquaSox. June 12, 2013 Seattle Mariners signed SS Jack Reinheimer.